In 2010 and 2011, Connecting Country assisted approximately 100 landholders to install 450 nest boxes across the Mount Alexander Shire and surrounds. These boxes were designed and installed specifically for the endangered Brush-tailed Phascogale – also know as the Tuan. Each year of so, we have gone back to check on the contents of the boxes (see our recent blog about this – CLICK HERE). At a good proportion of the sites, we find Tuans using the boxes. Much more commonly, we find Sugar Gliders or their nests in them – another native species, but not listed as threatened. On increasingly rare occasions, we find unwanted occupants that have set up a colony in the nest boxes – European Honeybees (Apis mellifera). In autumn 2016, 15 of the 450 nest boxes had active bee colonies, while many others had evidence of past colonies. In past years we have attempted to discourage wild bees from taking over these Tuan-targeted nest boxes through methods such as colony destruction and by retro-fitting the boxes to make them less attractive to bees. 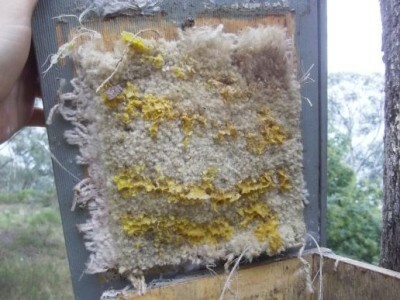 Carpet under the nest box lid had a poor success rate in discouraging bees (as seen from the residual bee wax). 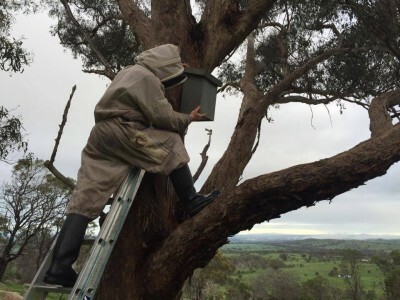 Earlier in 2016, Connecting Country was approached by Daniel BeeShepherd of the Castlemaine Bee Sanctuary. This organization’s aim is to ‘catch and lure swarms of honeybees and remove wild colonies …..These bees are then re-homed in responsibly managed hives and adopted out to hosts within the community.’ We accepted their offer to remove and responsibly re-home and manage the wild bee colonies that had taken over these boxes. With the permission of the relevant landholders, this is currently underway. The Castlemaine Bee Sanctuary is currently running a crowd-funding campaign to help cover the cost of purchasing and maintaining bee hives to house the translocated bee colonies. If you would like to learn more about this organization, and to possibly make a contribution towards the costs of their managed hives, follow this link for more information (CLICK HERE). 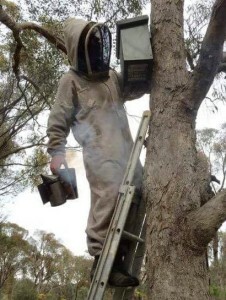 Smoke is used to calm the bees during nest box removal. Daniel removing a bee-filled nest box.